On a beautiful sunny weekend in Buxton, surrounded by the Peak District National Park, members of the BMC from all over the country gathered to have their say at the BMC Annual General Meeting 2019. Taking advantage of the weather and location, members joined together for walks, talks and discussions, and the presentation of the annual BMC Volunteer Awards on Saturday evening during the President's Dinner at the Lee Wood hotel in Buxton. This year’s Volunteer Awards were a change from tradition of presenting landscape paintings as the BMC commissioned mountaineer and artist Andy Parkin to create unique sculptures for the occasion. The awards were crafted from climbing equipment with a personal connection to Andy, along with other materials found on the mountains surrounding the Chamonix valley, such as copper collected from the roof of the Largentière Hut. Each award is truly distinctive and we hope their stories remind the recipients of their exceptional contribution to the BMC for many years to come. Onwards to Sunday, and the AGM in the quite spectacular Devonshire Dome building. Standing in the middle of the dome and listening to the acoustics and echoes was something we’d recommend to everyone, and we're pretty sure all members attending had a good go too. Positive vibes carried through to the open discussion, where members were asked to review the BMC's vision, mission, and core values. The session was very constructive, with lots of valuable thoughts and ideas being produced. It boded well for the rest of the day, and members were ready to get to the heart of the weekend. With BMC president Lynn Robinson excellently chairing the meeting, the AGM whizzed through all agenda items in record time. After the minutes of the previous AGM were passed, Dave Turnbull talked members through the recent work of the BMC as well as the changing nature of walking, climbing and mountaineering, and how they are perceived by the public. With Oscar-winning climbing films now being made, and the availability of similar media on Netfilx, YouTube, and the internet in general, it’s important that the BMC evolves to best understand and utilise these new channels of communication and technology. Without change, the BMC will lose touch with the next generation of outdoor lovers and important work such as access and conservation will be negatively impacted as a result. On that note, the BMC’s latest environmental campaign: Hills 2 Oceans was introduced. With the tag line ‘Removing mountains of waste’, this new campaign aims to help clear mountain environments of litter. It is estimated that around 80% of all the debris in our oceans and seas originates from inland, so the campaign will organise litterpicks and encourage the public to organise their own to eliminate this problem at the source. Following the presentation, Graham Richmond, BMC honorary treasurer, presented the BMC’s financial accounts and with the upcoming agenda item of an increase in membership subscription fees, there were many pointed questions about the BMC’s finances and the impact of a significant liability insurance claim on the BMC's premiums for such cover. These were all handled excellently by Graham and complemented with an explanation from Howden, the BMC's insurance broker. Then it was time to get down to business and vote on the agenda items. The first few items were passed relatively swiftly, the minutes of the previous meeting and the Annual Report. However, there was a minor speed bump with the Annual Accounts; Dave Musgrove proposed that administrative changes be formally recorded and explained in the AGM minutes, to avoid additional cost in producing a new set of accounts. Nicholas Baxendale from DonnellyBentley, the BMC’s auditors advised that this proposal was an acceptable approach, and the meeting then voted swiftly in favour of accepting the accounts. 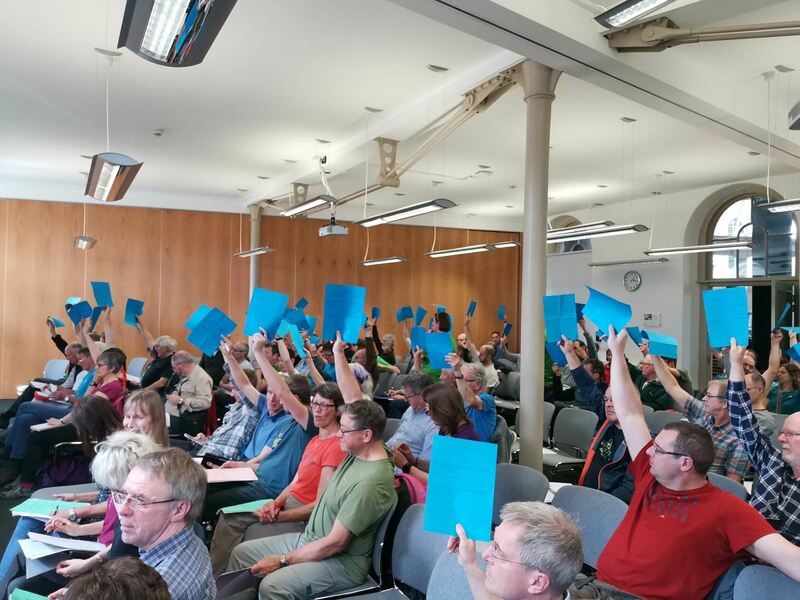 The next big vote was on Item 6 – the proposed new Articles of Association. Several changes had been recommended throughout the process of the Organisational Review and were now being proposed to be included in the new Articles of Association. With everything explained, and the changes already made available to view online in the run-up to the AGM, there was little contention to this item and it was passed with a comfortable majority. The meeting was gaining momentum now and it was time to vote on Item 7 – the Board of Directors appointments. First up, there were a number of uncontested appointments and Gareth Pierce and Fiona Sanders were voted in, as chair of the Board and National Council appointed director, respectively. Next was voting on three Nominated Directors positions for accounting and finance, clubs, and fundraising and grants. Voting was about to commence when several members voiced concerns that they didn’t know enough about the candidates to form an opinion. Lynn Robinson was quick to note that the information had been up on the BMC’s website prior to the meeting, but with a growing number of members asking for a short summary of experience and background from the candidates, it was agreed to allow the candidates to come up and speak. Huw Jones was voted in as the Nominated Director for accounting and finance, Jonathan White for clubs, and Jonny Dry for fundraising and grants. Congratulations to them all, we’re looking forward to seeing the good work they do in the future. And finally it was time for voting on Item 8 – membership subscriptions. Before voting commenced, an explanation for the reasoning behind the proposed increase in membership subscriptions was given. Again, Andy Goulbourne gave a presentation, which was gratefully received and went a long way to relieving members’ concerns on the matter. 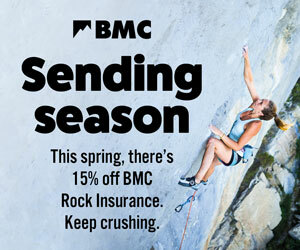 There were many questions, including asking why not just drop the combined liability insurance for BMC members to lower the cost of membership, but ultimately the increase was approved. Many thanks to all our members who voted; the BMC is nothing without its members and volunteers, and with that in mind it was time for Lynn Robinson and Gareth Pierce to thank those board members whose term in office had now come to an end – namely Rik Payne, Graham Richmond, and John Roberts. Gareth noted that they had all made considerable contributions to the BMC and that their dedication was very much appreciated. Emma Flaherty also stepped down as a vice-president but was unable to attend the AGM. And after all that, it was over! This year’s AGM was certainly less controversial than recent years, and it was great to see an air of moving on, introducing changes, and generally being more positive about the future. Many of the items voted on and approved will no doubt help steer the BMC in the right direction, and we look forward to what unfolds over the next 12 months. Item 6: Proposal to change the BMC Articles of Association – Approved. Item 7a: Appointment of Gareth Pierce as chair of Board of Directors – Approved. Item 7b: Appointment of Fiona Sanders as a National Council appointed director – Approved. Item 7c: Huw Jones elected as a nominated director of accounting and finance. Item 7d: Jonathan White elected as a nominated director of clubs. Item 7e: Jonny Dry elected as a nominated director of fundraising and grants. Item 8: Proposed increase in membership subscriptions – Approved.